A legend relates that the Saracens built Éze, but in fact it was originally a Ligurian (northwest Italian) settlement. For centuries Phoenicians, Romans, and Saracens took turns ruling the town. Though the inhabitants had to leave the security of the walls to find food and water, the castle offered protection from Germanic invasions and Muslim pirates. Gradually economic conditions made its protection unnecessary. Security in general improved, and so did communications and agriculture. The name Chèvre d’Or comes from the 20th-century discovery of the castle ruins. In 1924 an American violinist and his wife were hiking in the late afternoon and spotted a small goat in the distance. The rays of the sun had given it a golden glow. As they approached the goat, they found the ruins of the castle. 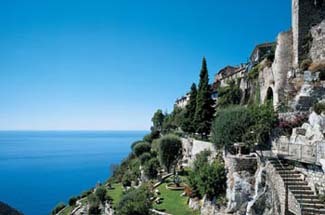 For over a 1000 years the little village and castle of éze have stood watch over the Mediterranean. A distinct anachronism amid all the glitter and high life of the Côte d’Azur, Éze would win any vote for the most charming hideaway along the coast. Well, it’s not too hidden away; the narrow, twisting streets can be very crowded. Éze is halfway between Nice and Monaco. On the autoroute from Nice, exit at La Turbie; coming from Italy, exit at Monaco. With sweeping views of the Mediterranean 400 meters below, the beautiful and romantic Château de la Chèvre d’Or is located on one of the most dramatic spots along the Côte d’Azur. Interiors feature fine stonework and beamed ceilings and are furnished with French and Italian antiques. Outside walls covered with ivy and bougainvillea surround a terraced swimming pool, and a patio sheltered under graceful arched colonnades makes an idyllic spot to while away time. Guest rooms are tucked into the ancient stone walls and open onto views of the coast or the hillsides. Dining here is a phenomenal experience. The hotel offers three restaurants and a Louis XIII-style bar. A Michelin-rated gourmet restaurant is perfect for that romantic occasion.